OXFORD, Miss. — The Ole Miss men’s basketball team returned home Wednesday night after a road trip to Destin, Florida and earned a record-breaking 93-86 victory over a solid San Diego team. 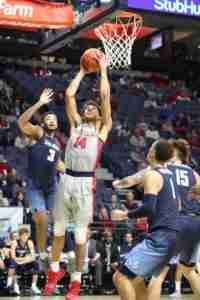 The Rebels shot 61.1 percent from the field, the best in school history in The Pavilion. The Toreros, who entered the game with a 5-1 record, were coming off a big home court win over a solid Colorado team and a strong early performance against No. 25 Washington, where they lost a close game by three points. Meanwhile, this was the fourth game for the Rebels in an 8-day stretch and their first of two in this week’s home-stand in Oxford. Entering tonight’s contest, the most prolific scorer for the Toreros was Isaiah Pineiro, a redshirt senior out of Auburn, California, who averages a near double-double at 22 points and over 8 boards per game. Wednesday night against a stingy Rebel defense, Pineiro played as advertised, notching 21 points and 4 rebounds in the loss to Ole Miss. As of late, the Rebels’ leader on the court has been Breein Tyree, who made the Emerald Coast Classic All-Tournament team along with teammate Devontae Shuler. The two currently average 21 and 14 points per game, respectively. The Rebels’ 61.1 percent shooting came against a talented San Diego defense. Tyree showed off his offensive efficiency tallying a team-high 22 points on 6 for 7 shooting, while Shuler finished the game with 13. Senior Terence Davis found early success on both sides of the court in the first half and gave his team the push it needed to hold a 39-37 advantage at the midway point. The Southaven native finished the game with 20 points; however, perhaps the most important number on his stat line might be the career-high 9 assists he contributed. 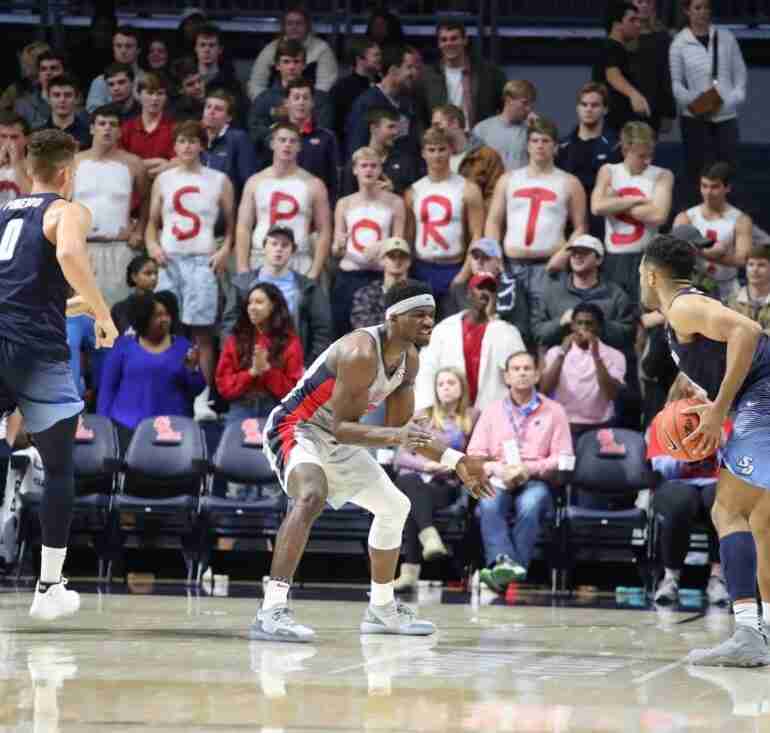 Blake Hinson, a freshman out of Florida, showed flashes of his bright Rebels’ future as he lit the scoreboard with a season-high 15 points, also going 5 for 6 from the free throw line. Ole Miss, behind the efforts of five players who finished in double digits, extended its lead to as much as 16 in the second half. We’re going to give the player of the game to the freshman K.J. Buffen who offered a solid glimpse of what the Rebels are beginning to look like under the new Kermit Davis regime. The big 6-foot-7 forward — who can shoot it from downtown, as well as from down low — hit 7 of 10 shots on his way to inking a new career-high in points at 15 for the night. Buffen also grabbed an impressive seven rebounds and seems to be getting more and more comfortable in the Red and Blue threads. Ole Miss had five players in double figures for the first time since Dec. 19, 2017 (vs. Texas A&M-Corpus Christi). Entering the game ranked second in the SEC and 25th in the nation in free throw percentage (77.4), Ole Miss improved on its mark by making 20 of 23 (87.0 percent). Breein Tyree scored a team-high 22 points, reaching double figures for the 12th straight game; Tyree is averaging 21.3 ppg over the last three games. Freshmen KJ Buffen and Blake Hinson tallied 15 points apiece, both career highs; Buffen also added a personal-best seven rebounds. Terence Davis dished out a career-high nine assists and added 20 points, the 15th 20-point game of his career; with his performance, Davis passed Terrance Henry for 33rd on the Ole Miss all-time scoring list and now has 1,099 points. 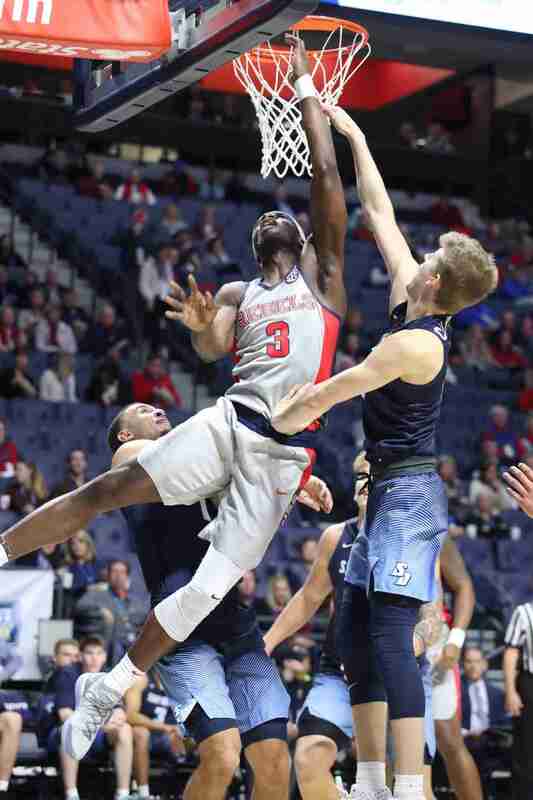 Ole Miss improved to 5-0 all-time against the West Coast Conference; it was the first meeting between the Rebels and Toreros. The Rebels (4-2) will take on the ULM Warhawks (3-3) on December 1 at 1:00 p.m. (CT) in the Pavilion. Previous article Matt Luke addresses the media and Ole Miss fans: "We will win here"